Winter in Johnston Canyon in Banff National Park in Alberta, Canada turns a majority of the falls into ice. 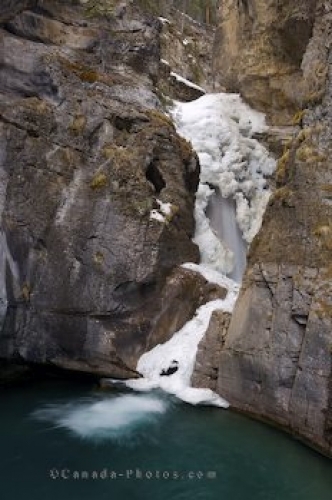 As the lower falls flow down the rock cliffs in the winter, temperatures in Johnston Canyon, Alberta can turn the cascading water into ice until warmer weather begins to melt it. Lower Falls of Johnston Creek in the Johnston Canyon, Banff National Park, Alberta, Canada. Picture of the ice falls of Johnston Creek in Johnston Canyon in Alberta, Canada.